Lately, Kia has demonstrated that if a car company makes stylish vehicles that are built to last, loaded with compelling features and priced fairly, people will buy them. The 2015 Kia Sorento is an attractive, well-equipped crossover, but disappoints in terms of fuel economy, performance in a critical new crash-test evaluation and other factors. The time has come for a total makeover if Kia wants the Sorento to remain compelling in this highly competitive segment. Korean automaker Kia, and its sister company, Hyundai, have hit upon the right formula to create popular cars and SUVs that sell in big numbers. It’s simpler to do than you’d think. Lately, Kia has demonstrated that if a car company makes stylish vehicles that are built to last, loaded with compelling features and priced fairly, people will buy them. This strategy works, and the 2015 Sorento, a crossover vehicle that straddles the line between the compact and midsize crossover SUV categories, is proof. Last year, Kia gave the Sorento a significant overhaul beneath the sheetmetal, but looks-wise, it hasn’t changed drastically over the past few years. Good thing its handsome, inoffensive looks have aged well. If you agree, you’ll be interested to know that Kia sells the Sorento in four trim levels: LX, EX, SX and SX Limited. 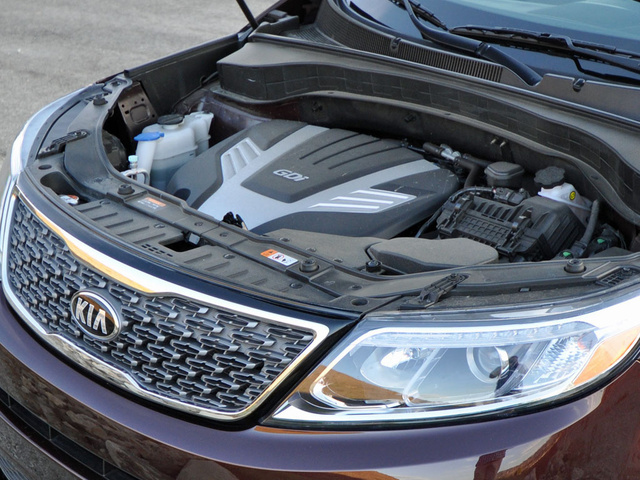 A 4-cylinder engine comes standard in the Sorento LX trim. A V6 engine is optional for the LX and comes standard in the other flavors. An all-wheel-drive (AWD) system is also optional, and a third-row seat is standard or available in most versions. The base Sorento LX ($25,195) is nicely equipped, while the Sorento EX ($32,595) includes a V6 engine as standard equipment, rides on larger 18-inch aluminum wheels and comes with LED running lights, fog lights, roof rails and rear parking-assist sensors. Inside, you’ll find leather upholstery, a power driver’s seat, heated front seats, dual-zone automatic climate control and rear side-window sunshades, along with UVO eServices technology, keyless engine start, a reversing camera and a blind-spot detection system. For 19-inch wheels, power folding side mirrors, a power tailgate and LED taillights, the Sorento SX ($37,595) is the version you want. You’ll also get upgraded exterior and interior trim, a navigation system, a premium audio system, a panoramic sunroof, ventilated front seats, rear air conditioning and a 115-volt power outlet. My test vehicle was this trim, equipped with AWD that brought the sticker price to $39,395. The top-of-the-line Sorento SX Limited ($40,795) wears shiny chrome wheels and Xenon headlights and cozies things up with premium Nappa leather, heated rear seats and a heated steering wheel. It can cost nearly $45,000 when fully equipped. My Sorento SX test vehicle wasn’t quite that nice, but given its price I was a bit disappointed in the quality of some of the interior materials. There were hard pieces where soft padding would have been appreciated, and while build quality posed no issues, there was an austerity about the cabin’s design that someone shopping for a vehicle costing almost $40,000 might find off-putting. 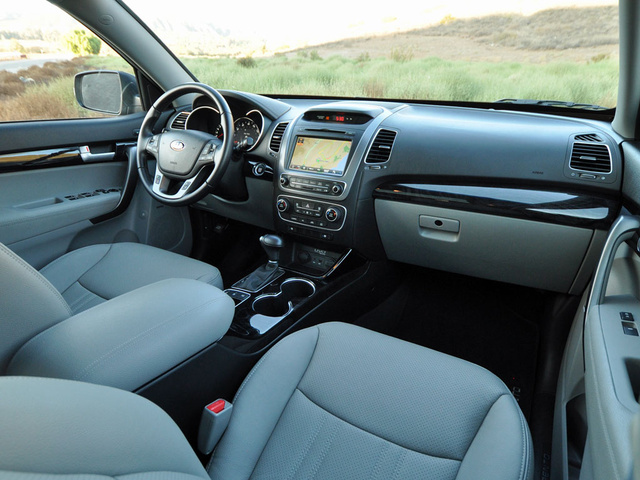 On the inside, the Sorento could certainly benefit from more of the exterior design’s personality and flair. Pop the Sorento’s hood and you’ll spot a 290-hp, 3.3-liter V6 that motivates this 3-row crossover with a pleasing growl and satisfying thrust. It’s connected to a quick-thinking 6-speed automatic transmission that holds gears for speedy freeway merges and passing slower vehicles. An Active Eco mode reins in the power by delaying transmission downshifts in an attempt to preserve fuel. Admittedly, during my week with this 2015 Sorento SX AWD, I didn’t use Active Eco mode. Gas is super cheap right now, as you may have noticed. The result, though, was a disappointing 18.1-mpg average in combined city and highway driving. For comparison, the EPA says the Sorento should return about 18 mpg in the city and 25 mpg on the highway. Front-wheel drive (FWD) is standard and should provide better gas mileage. Although my test vehicle had AWD, the system is designed primarily to add traction on slippery surfaces and not to tackle rugged trails, as the Sorento lacks the wheel travel of a capable off-roader. On a well-traveled mountain path, though, the system automatically sent power to the wheels with the most grip, delivering consistent traction and sure-footed control. The driver can even lock the system to evenly distribute power at lower speeds. Around town, in the Sorento’s natural habitat, the SUV proved easy to drive, thanks in part to a suspension that absorbs pavement irregularities while providing a nice, calm commute. Over speed bumps and drainage dips, however, it did show more body motion than expected, wallowing, bouncing and losing its composure, most likely due to the short wheelbase. On the curvy sections of my test loop, the Sorento was better behaved on long, sweeping curves than tight, twisty turns. The brakes inspired confidence either way, but the Sorento’s configurable electric steering felt either too light or too disconnected for my tastes. The 2015 Kia Sorento is hard to classify. 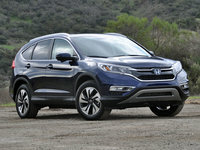 It’s too large to be a compact crossover and too little to be a midsize crossover. 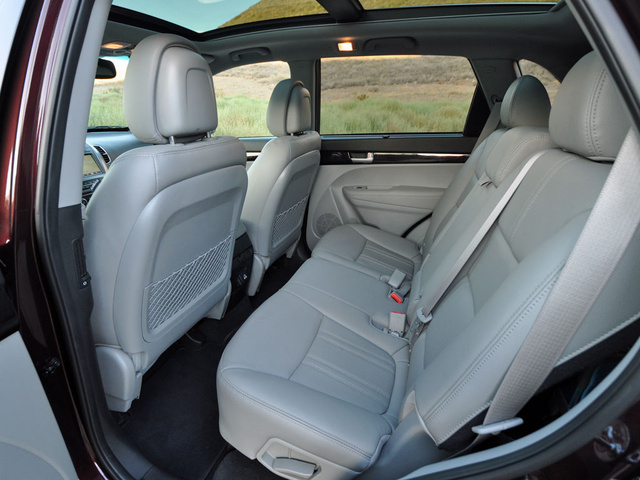 Fold the 50/50-split third-row seats down, and the Sorento holds 36.9 cubic feet of cargo behind the second-row seats. Fold those down and the Sorento swallows a maximum of 72.5 cubic feet of your stuff. The Sorento’s third-row seat makes this a viable option for people who sometimes need seating for 7, but not often enough to justify a bigger vehicle. There are downsides to it, though. Anyone stuck riding back there will complain about the lack of space and comfort. Also, when the third-row seat is in use, the trunk measures a paltry 9.1 cubic feet. Plus, the third-row seatbacks are mounted quite close to the Sorento’s tailgate, leaving precious little crush space if some moron behind you is more interested in what’s on a smartphone screen than the Kia crossover that has come to a stop up ahead. Except to test comfort, I didn’t use the third-row seat. I did, however, discover that the rearmost cargo floor panel flips up to reveal a useful bin for carrying groceries—and to contain 4 good-sized spoils from a trip to the pumpkin patch. 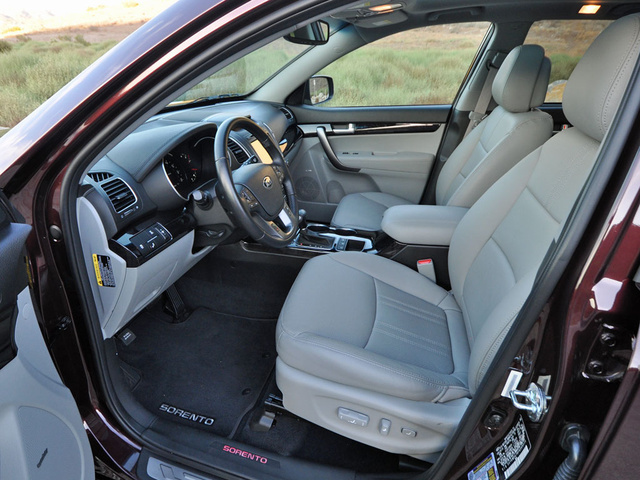 The driver’s seat is a pleasant place from which to pilot the Sorento, and my SX test model offered heating and ventilation in addition to numerous power adjustments. Visibility is good, too, thanks to large windows and clear sightlines, unless you have the third-row seat raised. Then you see nothing of real use in the rear-view mirror. The second-row seats are comfortable, and my test vehicle had both rear seat heaters and rear side-window sunshades, but legroom is not exactly spacious. The right outboard seat slides forward to assist loading people into the third row, but the space it provides is meager. Most of the Sorento’s controls are legibly marked, well located and easy to use. In particular, the infotainment system deserves kudos for its responsiveness and intuitive operation. Named UVO (short for Your Voice), the infotainment technology was developed in conjunction with Microsoft, and it allows you to speak system commands and to sync your smartphone, paving access to a plethora of eServices information and entertainment options. One notable feature is a Parking Minder app that works with Google Maps. Simply record the location of your Kia on your phone, and later it will guide you back to the vehicle. You can also enter destination information by sending it from your phone to the Sorento’s navigation system. With UVO, parents of teenage drivers can create geo-fenced boundaries and program vehicle speed and curfew limits, delivering alerts if the Sorento travels too far, or too fast, or for too long. Consider it a virtual leash of sorts. Kia hasn’t transformed the 2015 Sorento into a repository of the latest active safety features, but the higher trim levels do have the more important modern technologies. A reversing camera and rear parking-assist sensors are standard for EX models, while a blind-spot detection system is included for SX and Limited trim levels. Better yet, the blind-spot detection system shows warnings on the exterior mirrors, right where you’re already looking, ensuring that you will see them. The UVO eServices system includes a 911 Connect feature with Crash Notification Assist. As long as a smartphone is paired to the system and inside the vehicle at the time of impact, this feature automatically connects the Sorento’s occupants with authorities following a crash in which the airbags have deployed, communicating the SUV’s exact location in the process. While the Insurance Institute for Highway Safety (IIHS) has yet to rate the 2015 Kia Sorento, this year’s SUV is essentially identical to the 2014 model. Last year, the IIHS gave the Sorento a Good rating in all crash tests except for the small-overlap frontal-offset impact test, which produced the lowest score of Poor. 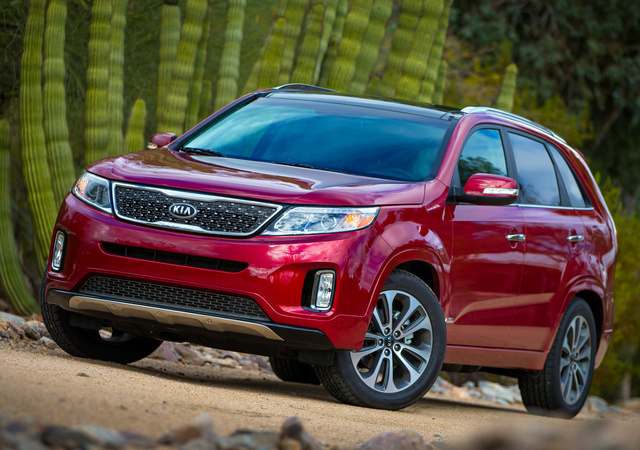 In National Highway Traffic Safety Administration (NHTSA) testing, the Sorento earns a 5-star overall rating. Remember when Kias were a cheaper alternative to Fords, Hondas and Volkswagens? Those days are over, but that doesn’t mean a Kia can’t deliver value. Unfortunately, when it comes to the 2015 Sorento, value is hard to discern aside from the terrific warranty and roadside-assistance plan. From disappointing fuel economy to relentlessly average quality, reliability and depreciation ratings, the Sorento fails to impress. Plus, Consumer Reports thinks this SUV will be comparatively expensive to own and operate. As the 2015 model year winds down, though, Kia will be offering big discounts on this SUV, perhaps large enough to offset some of the Sorento’s unfavorable ratings. Why is that? A completely redesigned 2016 Sorento is right around the corner, and if it proves as dramatic an improvement over the current model as other new Kia models have in recent years, you’re probably going to want the new one far more than you might want this old one. 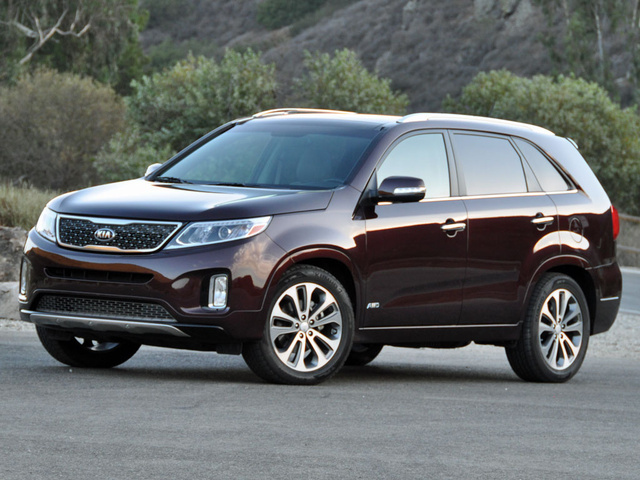 What's your take on the 2015 Kia Sorento? Cino The 2016 Sorento will be larger. Personally, i dont want that. The new Sportage is far too confining and had poor visibility. Sorento is comfy enuf. We test drove today (also Sportage-we own a '06 since new-and we drove a Subaru forester) the Sorento would be our choice. We didnt buy yet. A lil concerned about mpg, some get decent mileage from their Sorento's. 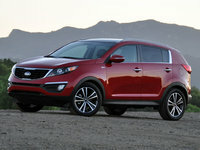 But mpg have not increased in sportage or Sorento? Since we bought our '06! 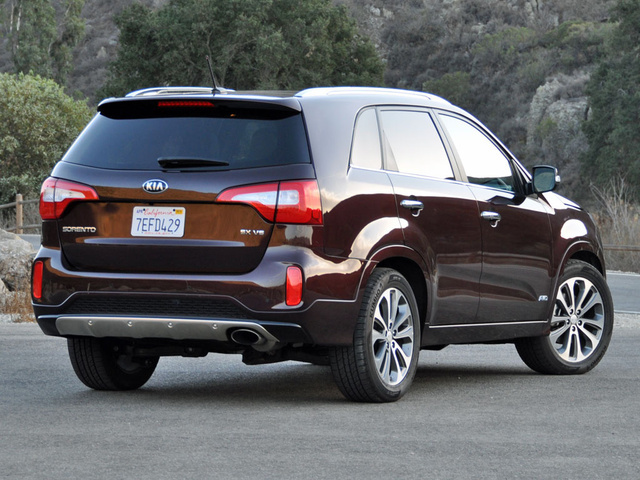 Users ranked 2015 Kia Sorento against other cars which they drove/owned. Each ranking was based on 9 categories. Here is the summary of top rankings. 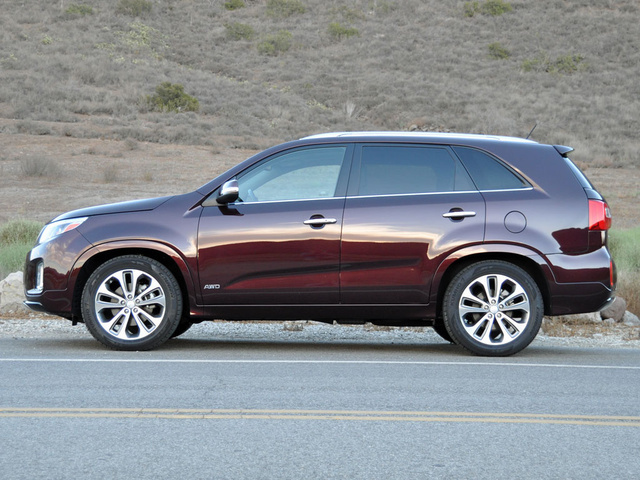 Have you driven a 2015 Kia Sorento? Bought 2015 sorento today. Went home when dark. Opened door and no lights inside.